This is part two of a series dedicated to tea's place in the modern dining room, sponsored by our brand partners at Pure Leaf. Jeff Ruiz wants to get all up in the cups of American restaurant goers. 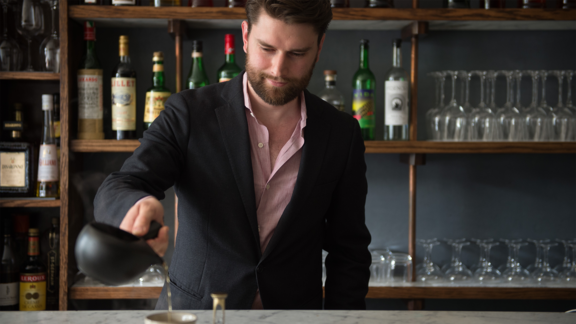 The former Tea Curator of Atera now spends his evenings perfecting the pots at newcomer Brooklyn hotspot Olmsted, where he serves as Service & Beverage Director. Why is it so important for you to expose people to better tea? Why is that part of your mission? A lot of people, when they first start getting into wine, they’ll say they had a wine epiphany. I had a tea epiphany. For me, that moment was in 2012, when I was first researching how to elevate the tea program at Atera. I went to In Pursuit of Tea and started tasting with Ana Dane, and it was my first time having a tea prepared for me in a more Eastern method. She just opened up my eyes. The tea was so aromatic, there was so much going on on my palate, and I was tasting it 15-20 minutes later. The finish was longer than any wine I’d ever had. It was an oolong called Oriental Beauty. We serve it at Olmsted now. It’s a really popular style of oolong in Taiwan, but you mention it in the US and no one’s ever heard of it. It’s really fun to introduce people to something like that every night. You went from one of Manhattan’s most revered fine-dining restaurants to a new Brooklyn neighborhood favorite. How are you elevating tea at Olmsted? I started getting really heavily into tea in a fine dining setting, but the thing about tea is that it’s also the everyman beverage. It’s the second-most consumed beverage in the world—the first being water. So, at Olmsted, we’re a very neighborhood, casual restaurant—none of the entrees are over $24, none of the teas are over $4. At Atera, one of the teas was $150 for a serving. At Olmsted there’s this really fun challenge of bringing these same teas that we used to get at Atera to guests at a really approachable price point and with a really unique method of serving. The goals of Olmsted were to expose people to better tea and to create a tea service that, if other restaurants wanted to replicate it, would elevate tea tremendously for everyone. 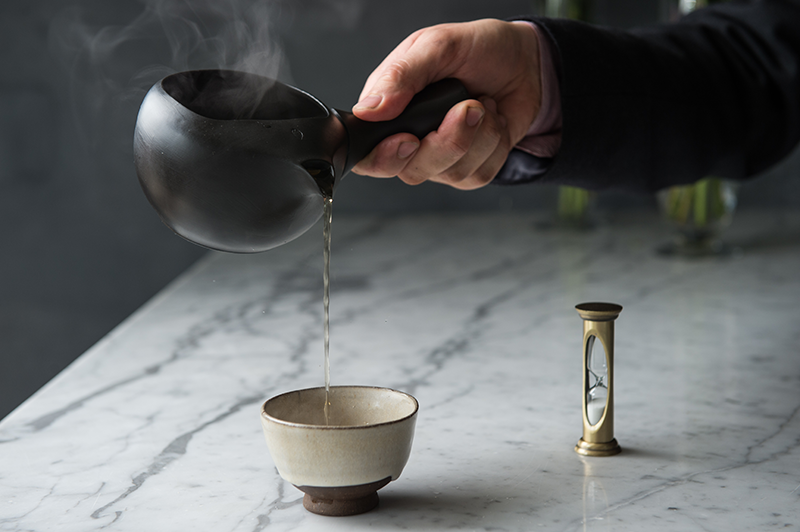 The problem with tea in most restaurants that are fast-casual is the tea service. You’re given a pot and a cup, and you pour it out yourself, and usually the last pour you give yourself is over-steeped. It’s bitter. So the last impression you’re left with at that restaurant is something bitter in your mouth. That’s the antithesis of what we’re trying to do in a hospitality setting. At Atera, it was easy to get around that because all the tea service is tableside. We controlled how long the water sat on the leaves depending on what kind of tea we were serving. You can do that in a fine dining setting. But at Olmsted, we wanted you to have the teas in front of you. So we portion all the teas out ahead of time, and there’s a prescribed amount of water, and it’s a three-minute steep for all of them. Everyone’s given a really beautiful three-minute hourglass timer. You decant all the tea from the pot into a pitcher, and then you can enjoy it from there. Are you seeing an uptick in interest around tea in restaurants in particular? I definitely do. The more people who have that “A-ha!” moment and who have great tea will then go looking for it. The more restaurants that offer it, the better. At Olmsted, we’ve figured out a model where the actual service involves less than a minute, and then people have this incredible tea in front of them. It just involves some thought. The average customer sees a tea for more than $6 and thinks, “It’s just tea.” We tried to make something really easy, really affordable and really delicious. Something for other restaurants to follow, hopefully. How do you get people to stop looking at tea and thinking “It’s just tea”? We’ve seen that mentality turned on its head in the coffee and beer industries, but how do you get people to stop doing that with tea? It’s just an organic, one-on-one thing. Every night, I’m telling people where to find this tea. It’s just a slow process. I think it’s what happened with coffee, too. Someone was given a shot of espresso that was made properly and they were like, “Wow, I didn’t know it didn’t have to be so hard to drink,” and that’s what started making people realize that espresso could be really beautiful and expressive. I think that kind of thing happens in a one-on-one context. You convert enough people and expectations start changing, and more people start expecting to have these things in restaurants. Hopefully that’s what’s going to happen. Do you think these beginnings are at all tied to the trend in low-ABV cocktails and session beers? Is that a possible in-road for tea in restaurants? One hundred percent. That was the thing at Atera, where we had a tasting menu with pairings. There’s only so much alcohol you can consume before the body reaches its limit of alcohol consumption and you’re useless. It doesn’t matter how seasoned of a drinker you are. For me, tea is this perfect non-alcoholic beverage that can break up that progression. You can have a whiskey, and then you can have a tea, and then a whiskey again, and you’re able to prolong the experience. It’s a lot of more sustainable. You’re getting all the same nuances you’d get from a great single-malt whiskey or a single-vineyard wine, if not more. Do you have a favorite tea on the menu at Olmsted right now? Right now, I really like this new hojicha that we just got in. Hojicha is a really popular style of tea in Japan. It’s a green tea. It’s the stem part of the plant—the part that’s usually thrown out—and it gets roasted, usually in a wok. That does two things: one, it burns off the caffeine content in the leaf—when they’re roasting it, you can actually see the caffeine crystallize. The second thing it does is create this dark, nutty flavor. It doesn’t taste like a typical bright green tea. It has these darker, roasted, nutty characteristics, and it’s really smooth. Do you have a favorite tea and food pairing? I like chocolate and really umami-rich Japanese green teas. If you do it right, you unlock this third flavor. To me, it’s like cantaloupe. It’s pretty wild. Anything that’s shade-grown for one or two weeks. Matcha or gyokuro will do the trick. What about tea and booze? Pu-erh and whiskey pairings are pretty fun. Or hoji-cha and whiskey. If you’re pairing a tea with food, what are some of the most important things to consider? Tannin. Bitterness. If the food already has a bitterness to it, tea is going to be really challenging to pair. That’s something I would avoid. Grapefruit is one of the hardest things to pair with tea, for example. Mushrooms, on the other hand, are really fun to pair with tea. Roasted fall vegetables, fresh spring vegetables with green teas. Umami with umami is always awesome. What’s been your greatest experience trying to make an “Ah-ha!” moment happen for a guest? Something happened last night, actually. Master Sommelier Chris Bates came in, and I served him gyokuro, and he said, “I’ve never been able to make this tea properly before. This is the best tea I’ve had in my life.” When you hear that from someone who’s at the top of the wine game, that’s a really cool moment. What about your own greatest moment as a tea drinker? The first time I tasted gyokuro, for sure. It knocked my socks off. I’d had matcha before, but gyokuro is a whole other animal. There’s nothing else like it on the planet. I don’t want to play favorites, but gyokuro is just insane. Last question, and it’s a big one: why do you love tea, anyway? It’s delicious—if it wasn’t delicious it’d just be interesting, and interesting isn’t necessarily fun. It just tastes great.